The 2004 United States presidential election in California took place on November 2, 2004, and was part of the 2004 United States presidential election. Voters chose 55 representatives, or electors to the Electoral College, who voted for president and vice president. California was won by Democratic nominee John Kerry by a 9.95% margin of victory. Prior to the election, all 12 news organizations considered this a state Kerry would win, or otherwise considered as a safe blue state. Republicans have not taken California's electoral votes since George H.W. Bush's victory in 1988 against Michael Dukakis. As of the 2016 presidential election[update], this is the last time a Republican presidential candidate received more than 40% of the vote in California and where the margin of victory was in single digits, as the state swung hard toward the Democratic Party in the following election. 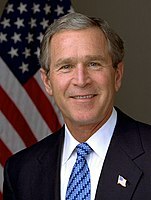 Bush remains the last Republican candidate to win the following counties in a presidential election: Fresno, Merced, Riverside, San Bernardino, San Diego, San Joaquin, San Luis Obispo, Stanislaus, and Ventura. This also remains the last presidential election that a Republican won more than a million votes in Los Angeles County. Kerry won every single pre-election poll. The final 3 polls average Kerry leading at 52% to Bush at 43% to Nader at 2%. California was once a Republican stronghold, supporting Republican candidates in every election from 1952 through 1988, except in 1964. However, since the 1990s, California has become a reliably Democratic state with a highly diverse ethnic population (mostly Latino) and liberal bastions such as the San Francisco Bay Area and Los Angeles County. The last time the state was won by a Republican candidate was in 1988 by George H. W. Bush. In 2004, the state did swing slightly Republican by a 1.9% margin from 2000 due to strong swings in heavily populated San Diego, Orange, Riverside, San Bernardino, Kern, and Fresno counties, all of which (except San Diego) Bush won by double digit margins. Bush also won over a million votes in Los Angeles County, the most populous county in the United States. Bush also benefited from strong support by Arnold Schwarzenegger, the state's Republican governor. These factors likely contributed to California being closer than expected in 2004. Nonetheless, this proved the first time the Democratic Party had won remote Alpine County since 1936 and only the third in that county’s 140-year electoral history, and the first time the Democratic nominee carried neighboring Mono County since 1940, and only the seventh since that county was formed in 1861. Kerry countered Bush's improved performance in Southern California with large swings towards the Democratic Party in Northern California, including the Bay Area, where he won over 70% of the vote in Alameda, Marin, Santa Cruz, and San Francisco counties, winning over 80% in the latter. Kerry won 31 congressional districts. Bush won 22 congressional districts, including 2 districts held by Democratic representatives. Technically the voters of California cast their ballots for electors: representatives to the Electoral College. California is allocated 55 electors because it has 53 congressional districts and 2 senators. All candidates who appear on the ballot or qualify to receive write-in votes must submit a list of 53 electors, who pledge to vote for their candidate and his or her running mate. Whoever wins the majority of votes in the state is awarded all 53 electoral votes. Their chosen electors then vote for president and vice president. Although electors are pledged to their candidate and running mate, they are not obligated to vote for them. An elector who votes for someone other than his or her candidate is known as a faithless elector. The following were the members of the Electoral College from California. All were pledged to and voted for John Kerry and John Edwards. ^ Loughlin, Sean (September 1, 2004). "Schwarzenegger's star power dazzles delegates". CNN. ^ "President" (PDF). California Secretary of State. 2005-02-22. Archived from the original (PDF) on 2013-07-21. Retrieved 2008-07-09. ^ "Report of Registration as of October 18, 2004" (PDF). California Secretary of State. January 7, 2005. Archived from the original (PDF) on July 10, 2008. Retrieved January 16, 2013.